Yoyo Clips are essentially Retractable ID Card Holders, making it easier for you to carry around Key Cards, ID Cards, Access Cards, Badges etc. It comes in Metal Body with a Steel Clip attached at the back and an elastic string. Tired with your employees misplacing Key Cards, ID Cards etc. Yoyo Clips are a perfect solution to your hassles. Shop Completely Personalized Yoyo Clips for your Brand, Company, Startups today. 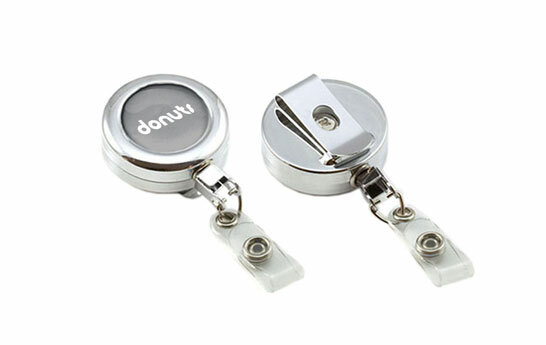 Yoyo holders or yoyo clips as they are called, in simple terms, are retractable ID card holders used to carry key cards, ID cards badges etc. They essentially come in plastic as well as metal, with a steel clip attached at the back along an elastic string. These Yoyo ID card holders from PrintStop are what you need to market your business. These card holders are a new way to do that. At PrintStop, Yoyo card holders are customisable according to your business needs, with your brand name and logo. You can easily engrave your business name on your retractable Yoyo ID card holders with us. These customised yoyo lanyards can be distributed in your office or your company to your employees so that they don’t misplace their ID cards and key cards. Plus, this will turn in to marketing for your business as these yoyo tag holders will have your business brand and logo attached to it wherever your employees go. Thus, customised yoyo card holders are great for brand awareness and re-marketing. Also, they’re a great tool for promoting your business in a trade show or an event. These yoyo ID card holders are highly appreciated by our clients because of their ductile nature and printing quality. PrintStop’s yoyo Id card holders or yoyo lanyards are perfect for you if you own a school, business, college or a corporate organization. Our yoyo card holders are easy to attach and fit in quickly. Plus, they are lightweight with a customisable range of 20mm for your brand name and logo. Retractable badge holders are one of the most popular choices to display your ID cards and key cards or badges. With our customised yo-yo tag holders, the scanning of an ID card becomes much easier and simpler. PrintStop makes the printing procurement easy on any product, so these yoyo ID card holders can be easily printed with your business name and brand logo. We at PrintStop, keep coming up with new customised business products for you to be able to market your business effectively. These affordable and cost-saving yoyo ID card holders are a must have for your business. The minimum order quantity for yoyo ID card holders is 50 and the maximum is 500. At PrintStop, 50 yoyo Id card holders are available for Rs 3200/- As the quantity increases, the price decreases. Here, you can get Yoyo ID card holders, business lanyards, ID cards, name badges and many other different types of business products.